When astronauts blast off for space, the quick upward acceleration of the rocket results in a force pushing down on the astronauts’ bodies. This force is so strong it has its own name. It’s called g-force. The g in g-force is a reference to the force of gravity on Earth which is the standard for measuring g-forces. Although it’s called g-force, it’s not really a force but an increase in weight due to sudden acceleration. Imagine sitting in a chair and a Sumo wrestler sits down in your lap and then leans back into your face and chest. The effect would be similar to what happens to your body under high g-forces. A fighter pilot performing aerial acrobatics can experience g-forces up to 9gs. Such high g-forces can have serious physical effects as the heart struggles to pump blood to the brain. The result can be an inability to see, hear, move or think. A complete loss of consciousness or even death can occur. Circus performers shot out of cannons experience g-forces up to 7gs. These performers, known as human cannonballs, start their journey tucked away, still and snug, inside a cylinder in a cannon. They make their bodies tense and rigid as compressed air is injected into the bottom of the cannon. The air pushes against the cylinder which in turn pushes the cannonball performer out of the cannon sending them soaring 125 feet in the air. Human cannonball performers aren’t actually ever exploded out of a cannon, they’re always pushed out with compressed air. The noise and smoke that erupts from the cannon when the performer flys out is added for effect, creating a spectacle for the audience. 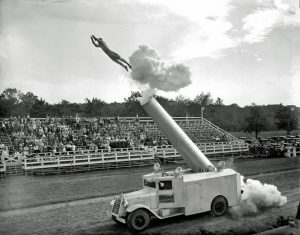 Unlike astronauts, human cannonballs don’t stay in the air very long. Within a couple of seconds they’re already heading downwards. It’s an old joke, but it’s true, it’s not the fall that’s dangerous for human cannonballs, it’s the re-acquaintance with the ground. If they miss the safety net they can end up with broken bones, busted joints, damaged organs and an early, unnecessary death. When we tread the path of meditation and self-knowledge we might feel the allure of sudden realization. We want to be shot out of the cannon of mental drudgery to the heights of instant enlightenment. We weigh our minds with golly-gee forces and enthusiasm, pushing to make mental magic happen. What we may not realize is that there are no real explosions of enlightenment. The stories of sudden awareness are not real gunpowder explosions but fake noise and smoke generated for spiritual spectacle. The only way to create real change, everlasting change, is to bring it about gradually, over time. Just as human cannonball performers spend years and hundreds of hours training to be suddenly shot out of a cannon, the stories of the sudden realizations in ancient meditation literature involved practitioners who spent years and hundreds of hours diligently walking the path before awakening. 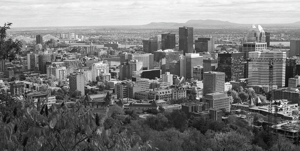 While visiting Montreal, Canada my wife and I ascended to the top of Mount Royal to a height of 700 feet. We walked along a winding path carved into the mountain, shared by pedestrians, baby strollers and bikers. No one was shot out of a cannon and blasted to the top. Once at the top we sat in a café enjoying the charming vista of the city of Montreal below us while we sipped tea and nibbled on French pastries. Ancient discussions of the path talk about walking the path not running the path or driving the path or rushing the path. There are many walking meditations but no hurry up and let’s get there as fast as we can meditations. There’s a reason for that. We don’t want to be thrust to momentary heights of insight to come crashing down to the pain and heartache of earthly existence. We want to slowly rise to a durable, everlasting awareness. We want to sip from the cup of wisdom and nibble on the delicacies of tranquility while quietly observing the antics of the world around us. Mind elevaters put aside the idea of the quick fix and the instant awareness. They sit down and do the work of gradual change, real change, permanent change that brings about enduring calm and joy.